View all the MLS listings for New and Resale homes and buildable land lots in the various Brunswick Forest Neighborhoods. Questions? Want more information? 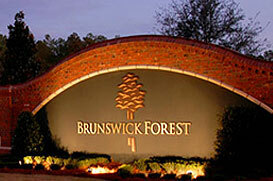 Let me send you a complete information package with complete Brunswick Forest Community details. Or, call me and I can answer all your questions and even arrange a private tour and accommodations for you. Brunswick Forest in Leland, NC is a top choice for many fun loving active adults and young retirees who are relocating to the south for it’s low taxes, warm tropical climate, and high quality of life. With a very diverse neighborhood structure, Brunswick Forest offers resale and new homes ranging in price from the mid 200’s to over 500K. The custom homes section features stunning water and golf course views and the ability to build the home of your choice. While other neighborhoods in Brunswick Forest have semi-custom homes that follow a particular theme such as Cottages, Craftsman Style, Charleston, Floridian, etc. As a home buyer in Brunswick Forest, NC you have many choices in who can represent you and while any REALTOR can show you around, it is very important you select an agent who “knows” Brunswick Forest. Our Agents are Brunswick Forest Community Experts and can help you throughout the entire process. Not only do they know Brunswick Forest, but they also know the surrounding area and will gladly give you a tour of area around Brunswick Forest. They will show you what’s important to you, whether it be Wrightsville Beach or historic downtown Wilmington or even the area’s best golf courses (including Brunswick Forest’s Cape Fear National), our agents will always make sure your time is well spent and focused on what is important to you. Getting to know Brunswick Forest starts with our FREE information package that includes everything you will need to know about life at Brunswick Forest. Our package starts with a complete map of the community, the breakdown of all the neighborhoods with starting price ranges, a list of Brunswick Forest amenities both current and planned, area tax rates, climate information, currently available resale & model homes and an invitation to stay at Brunswick Forest, as a guest for a 2, 3 or 4 days so that you can experience the Brunswick Forest Lifestyle for yourself.